On February the 8th 2018 the Iron Door of Palazzo Contarini Della Porta di Ferro will open for you ! This gothic Location will host Casanova Cocktail Party ! We will asthonish and involve you with amazing and awesome exibitions. Do you whant to learn Minuetto dance or do you prefere to be mesmerized by our international artists ? 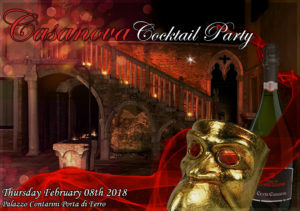 It will be an unconventional extraordinary and unforgettable Carnival Night . Two rich Buffet to indulge tasting delicious ” Cicchetti Veneziani ” and toasting with Prosecco Casanova Cuvèe . And then , you’ll transform in a modern Casanova, enjoyng dancing, when Palace will become a refined Discoteque. If you prefere a more intimate atmosphere, you can choose to have a Dinner Placè in one of the two reserved Vip Lounge at the Noble Floor with dedicated entertainment.